Eurosky, a joint Korean-French exhibition planning company, is hosting a wine festival and exhibition at the SETEC ( Seoul Exhibition Trade Center ), located in Gangnam from Nov. 03 – Nov. 06, 2005. Wine sales have experienced exponential growth in Korea since the late 90s, signifying the increasing level of consumption amongst the 20-30 age group. Despite growth of almost 30 percent annually the organizers believe the Korean market still has huge potential for further expansion. High prices, limited supplies and varying quality are seen as obstacles to growth and the festival aims to introduce Korean importers and wine lovers to numerous producers and wines with a focus on superior, yet more affordable products. Today, wines can only be imported into Korea by licensed wine and liquor importers. There are about 130 licensed importers in Korea, but only 20 are active. Most importers also have a wholesaler's license, which allows them to distribute wine to retailers. However, the Korean Liquor Act prevents retailers and end-users from purchasing wine from other retailers and discount stores for resale purposes. These restrictions are one reason for the broad range of wine prices. Korean consumers pay very high prices for imported wines due to import duties, taxes and distribution costs. The European Union (EU), especially France, has traditionally dominated 80 percent of the Korean wine import market. Although many of the participants at the exhibition are indeed from the EU new world countries such as New Zealand and South Africa are also scheduled to attend. Worldwide the wine industry has become more global in recent years with producers from an ever — increasing list of countries and locations vying for a share of the market. Some 20 countries will be represented at the event including Algeria, Argentina, Australia, Austria, Bulgaria, Canada, Chile, France, Germany, Greece, Hungary, Italy, New Zealand, Portugal, South Africa, Spain, U.S.A and Korea. The focus of the exhibition is on connecting importers and producers who may be unfamiliar with each other. Just as some Korean importers are unaware of certain wines and producers so too are some producers unaware of the untapped potential which exists here. Interestingly a proportion of the producers participating are Korean. Supplementary events will include International focus events and some educational programs regarding the history of wine. Free wine tasting will be on offer and at the exhibitions close the best wine will be selected by the press experts in attendance. 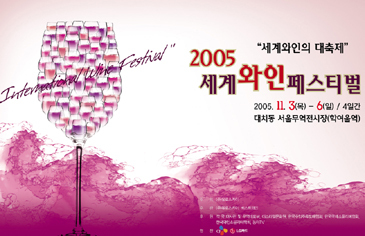 For more information on the exhibition itself you can check out the official website at www.winefestival.co.kr. Mr. Peter McCrossan serves as staff writer for The Seoul Times. The Irish journalist studied computer science at University College Dublin. Mr. McCrossan covers diplomatic community affairs, travel & hotel industry, and local social issues.